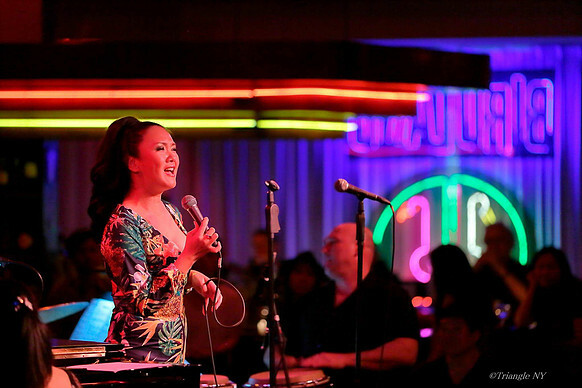 A Japanese born New Yorker, Mari Koga, has been singing professionally since her early 20’s. Early on, she won first prize at the 10th Annual Jetstream Young Vocalist contest. She was soon very much in demand as a young Jazz singer in Japan. Mari moved to New York City to immerse herself in the New York jazz scene and started performing regularly at many popular venues in NYC. Eventually she reached the stages of New York’s prestige jazz clubs such as Blue Note, Birdland, Zinc bar and Subrosa etc. She also appeared as a re-imported singer at Japan’s top jazz venues such as Body & Soul, Jazz in Lovely and Royal Horse etc. Mari has also performed in commercial films with clients such as the American Plastic Council and Marriot Hotels. Mari also performed as a back up singer for salsa trombone player, Jimmy Bosch’s “La Orquesta de Jimmy Bosch” and appeared at various clubs and jazz festivals, including SOB’s and Savanna Music festival etc. Mari released her new album “PERFECT BLUE” in 2015 which contains her unique arrangements of jazz standards, Afro-Latin influenced original songs. Also a pair of Salsa and Flamenco Jazz, sung in Japanese. She successfully completed her “Perfect Blue release tour in Japan.” in 2015 and 2016. “Invitation”, the first track of the album hit No.1 on the most popular download of the month of All About Jazz in April 2015 and the Salsa song “Lluvia de Lagrimas” has been heavily rotated with some FM stations in US, Japan and Latin Americas. Audiences have been delighted by her unique repertoire, which includes original songs and unusual arrangements of jazz standards with a touch of Afro-Latin, and by her throaty horn-like improvisational scatting style.